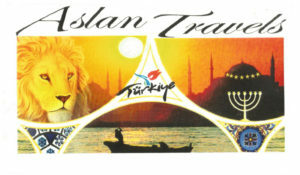 Aslan Travels is my post about living in Turkey today. It is about traveling and being with Aslan. This picture above is my card. On this page I will explain its symbolism. On the upper left there is a painting of a lion. The sky line silhouette both the Blue Mosque and to the right the Hagia Sophia. The Menorah is the candle stick on the far right of the card. There are 7 stars above the Menorah. The fishing boat drifts in the dawn under the bridge or circle of time. This lion is also on the cover of the book, “Chronicles of Narnia” by C.S.Lewis and illustrated by my beloved friend Debbie Maze. Aslan means Lion in Turkish. C. S. Lewis wrote about the Kingdom of God and used the lion named Aslan to represent Christ. Aslan travels to me means that the Lord is on the move and where the Spirit of the Lord is, there is liberty! The Blue Mosque is a large Muslim place of worship. It was built in the early 1600’s almost 200 years into the Ottoman Empire whose headquarters were in Constantinople, or present day Istanbul. The Hagia Sophia’s full name in Greek is Ναός τῆς Ἁγίας τοῦ Θεοῦ Σοφίας, “The place of the Holy Wisdom of God.” It was construction in 537 and was a Church all away up until 1453 when it became a mosque with the fall of the Byzantine Empire. Now it is a museum. The seven stars are in place of the present day windows in the Hagia Sophia. There is more about the stars at the end of this post. The dawn is of the new day of the prophetic. The fisherman is the call to be fishers of men. And why a Menorah on the card? 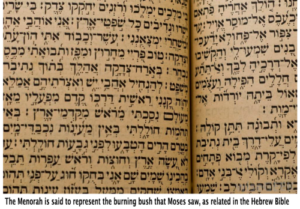 The Menorah is said to represent the burning bush that Moses saw, as related in the Hebrew Bible (or Tanakh). Historically, one was used for ritualistic purposes in Jerusalem during the time of the Temple. It burned olive oil. The Temple Menorah remains on record until sometime during the sixth century, after it was brought to Constantinople. They say all roads lead to Rome but history seems to return so often to Constantinople which is present day Istanbul, Turkey. Menorahs today typically have seven or nine branches. During the time of the First and Second Temples, candelabra had seven branches. After the Temples were destroyed, which is said to have been around 586 BCE and 70 CE, respectively, a custom developed to preserve the sanctity of the Temples — not to reproduce things from the Temples. In more modern times, some Jews have returned to using a seven branch menorah. In terms of symbolism, it is the menorah, not the sign of David, that is the symbol of Judaism. Interestingly enough, the Menorah is also part of Revelations 1:9-20, the final book of the Bible. Now today the seven churches are in Turkey where I live. My husband and I live in Smyrna which is present day Izmir. It is one of the stars above the candles. Thus I wear a golden Menorah. It symbolises where I have found my home. I have given my card to thousands of people traveling throughout Turkey and throughout the world who I have met on one road or another… on land, sea and/or through the air. I offer my card to you. Please keep in touch. Oh! I almost forgot. Türkiye is the name of this country in the Turkish language and the tulip is one of its many symbols. But that’s another story.